So is it really any surprise that a recent study done by researchers at the University of Sussex suggests that horses may be able to recognize human emotions? 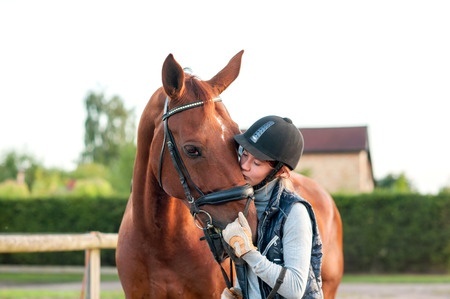 This study, as reported by Science Daily, dives a little deeper, suggesting that horses can not only pick up on human emotions, but are able to read our facial expressions to figure out what we’re feeling, or at least, anticipate what will happen next. The study showed photographs of men who were unfamiliar to the horses making either a happy or angry facial expression, and measured how the horses responded. When an angry facial expression was shown, the horses’ heart rates increased, and they turned their heads to look at the man’s face with their left eye. Researchers aren’t unfamiliar with this left-eye tilt, as it’s been noticed before in dogs as well and is believed to be an indication of how the brain processes threatening stimuli. It’s possible that this study picked up on the horses’ ability to react to human facial expressions based on their previous training: when confronted with an angry trainer, a horse may expect rougher handling than when confronted with a smiling, happy-looking person. Scientists are particularly interested in the fact that these horses were able to pick up on a negative emotion on a face that looked very different from their own. This proves the “… assessment of negative emotion is possible across the species barrier,” says Professor Karen McComb, co-lead author of the research, in the Science Daily release. These findings, which will likely be tested further and in varying studies, may well impact the method of horse training that we’re all so familiar with – we’ll have to stay tuned! At Deer Creek Structures, we aren’t psychological counselors – for human or horses – but we can help make your horses and livestock more comfortable with high-quality barns and sheds. Check out our inventory online now or give us a call today at 254-546-2276 to learn more.